A retailer pre-order card suggests that the Wii U version of Super Smash Bros. will launch just over a month after the 3DS version. Fans of Super Smash Bros. were somewhat dismayed to discover that while they'll be able to get their hands on the 3DS version next month, the Wii U version had been stuck with an ambiguous "Holiday, 2014" date. Many expected that it would launch just in time for Christmas, but according to a retailer leak, it may be a little bit earlier than that. Twitter user BlueDriveBuster posted the picture you'll see to the right, which claims a November 21 launch date for the game. The card seems to have come from the American retail chain Fred Meyer, and does look pretty authentic. The date does fall under the holiday/winter release schedule Nintendo laid out for the title, and having it launch sooner, rather than later, and so close to the 3DS version, would certainly make a lot of sense. BlueDriveBuster also added that the store had received "a memo from Nintendo telling us we can't display them 'yet'," hinting that official word from Nintendo is imminent. Of course, nothing is confirmed until we hear it from Nintendo itself, but this wouldn't be the first Super Smash Bros. leak that turns out to be true. If you're struggling to decide whether to pick up the 3DS version on launch, or wait for the Wii U release, you should check out our preview of the Japanese 3DS release. Wait, so the same day as the new pokemon?? WHY MUST I CHOOSE!?!? Looking forward to it. I don't have a WiiU, but Smash Bros is one of my favourite franchises, so... yeah, if this turns out to be great, I'll have some interesting decisions to make. If I had a WiiU, I'd wait for that version without any doubt, but as it is I'm not sure if the 3DS version -- the only one I'll eb able to play -- is worth it. You can always try the demo, when it comes out to the public that is, I was surprised how well this version played. Whelp, that's surprisingly close. I kinda wish it was released later, I'll be right in the middle of class work at this point. friday (19.9.2014) is Hyrule Warriors, already pre-ordered. 24.10.2014 is Bayonetta 1 & 2, already pre-ordered. 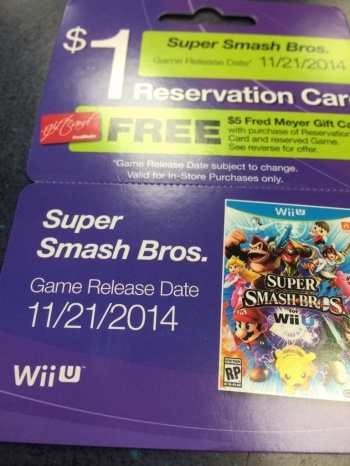 November 24th, 2014, is SmashBros, soon to be pre-ordered. Why would Nintendo choose a release date that clashes with Pokemon? Source doesn't seem reliable enough for me to believe it. If it does come out in November, then I'm honestly betting it will be after Pokemon Omega Ruby/Alpha Sapphire come out. It would cannibalize their sales too much by releasing them on the same day. Honestly I see them being released a week apart from each other, but Nintendo never really releases 2 of it's big franchise games on the same day, just so that it wouldn't cannibalize sales. I also say that, as I'd be spending $140 in one day since I'm buying the Complete Smash Bros Wii U bundle that comes with the GameCube adapter and the controller, as well as Omega Ruby. Not to mention I still need the monies for Kingdom Hearts II.5 HD ReMix...my wallet is already crying more than it is. Hell, next Friday I'm getting Hyrule Warriors (with the Skyward Sword DLC because f*ck GameStop) and then the week after that I'm getting Smash Bros on the 3DS. Yep, that's my basic plan for buying new releases in the coming few months too. I hope there is at least a week difference between Smash U and Pokemon. I can see why they want to get both out before black Friday, but last year Nintendo did a great job spreading their game releases out over the fall period. Gonna get both. Just so my GF can get whupped by me. If true there is a guy at IGN who is getting a lot of steak dinners! People at IGN were betting its not out this year and using the literal definition of winter (which starts end of December) rather than the definition of winter used by any other video game, and lots of steaks were bet! I'm already starting to collect a few games for my Wii U (which should be within my household come the 26th), now this happens! Too many games, man! But yeah cool Nintendo, liking that you announce this (especially since Bayonetta 2 is released a month later in Europe and I needed to recover). Because the Wii U SSB demographic and the 3DS demographic probably aren't going to clash all that much honestly. More than likely it's released at that period specifically for black Friday where everything is on sale. The people who wanted ORAS day 1 have more than likely made enough in preorder purchases that they just don't care.